Even though the book has been closed on the Nike KD 5, there are still a good number of pairs that we never not a good look at. In most cases those sort were previewed at one point on the social media accounts of a couple of KD’s closest friends and family. 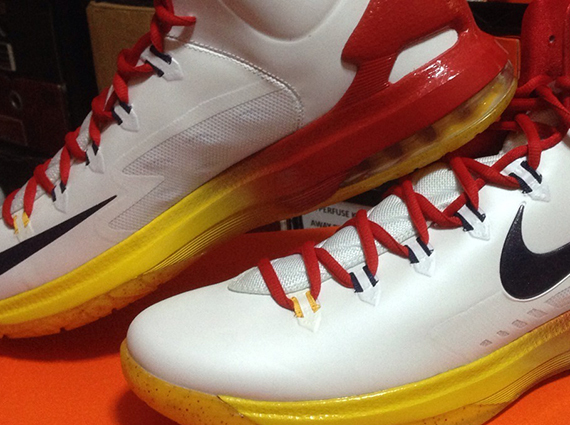 You’ll recognize this gradient-soled Nike KD 5, a pair that remains in PE purgatory, from that avenue. The coloring in place is kind of a strange choice for a PE given how far off it is from your typical OKC look. Continue reading to see more of the shoes and then see how much they’re going for from simon-llo on eBay.